In the fertilizer storage industry, corrosion is a fact of life. The high ammonia content causes metal to corrode and weaken — which can eventually cause storage buildings to deteriorate and become unsafe. But it doesn’t have to be that way. 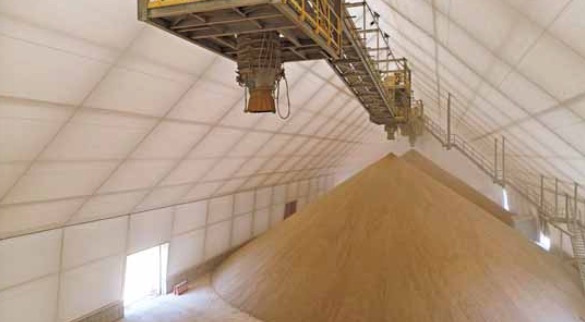 Using non-corrosive building materials, as well as making a few design changes, will result in fertilizer storage buildings that last longer and require less maintenance. 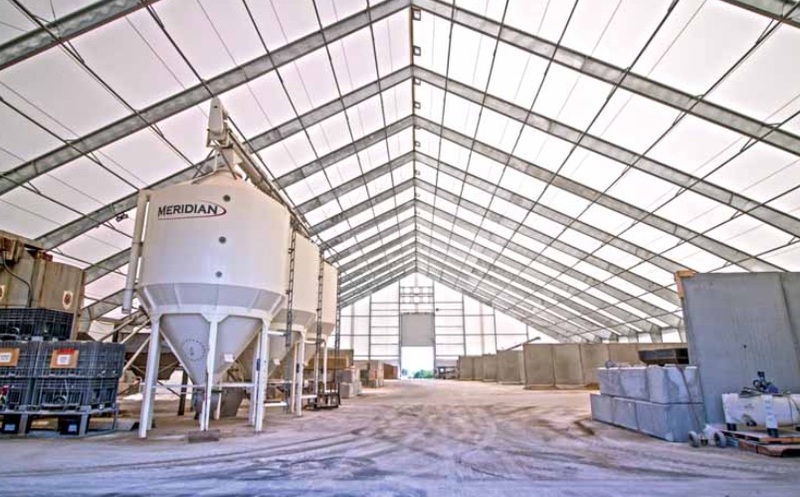 Fabric buildings are a practical choice for storing fertilizer — the fabric is non- corrosive, so it will not weaken when exposed to corrosive materials such as fertilizer. Legacy Building Solutions uses an exclusive ExxoTecTM coated PVC fabric, which in addition to being non-corrosive is designed to withstand daily exposure to industrial use, UV rays and moisture. This fabric is warrantied in even the most corrosive environment. The steel building frames are another element that can weaken or fail due to corrosion. Previous generations of fabric buildings relied on open web trusses for support. Open web trusses are made of a series of hollow tubes – which can corrode from the inside. This interior corrosion often proceeds undetected until it is too late to fix the problem. Instead of relying on hollow tubes, Legacy Building Solutions uses solid steel I-beams as the frame. These solid beams have no unseen areas where corrosion can begin. All steel beams are fabricated of heavy steel plate up to one inch or more, making them a long-lasting choice in any environment. In corrosive situations such as fertiliser storage, the beams should be hot dip galvanized. Hot dip galvanizing applies a solid layer of protective zinc to the beam, protecting the steel from exposure to corrosive chemicals. Of course, any exposure to bulk fertilizer is able to cause corrosion. Legacy’s building system includes the option to add a fabric liner to the interior of the frame. This liner creates a continuous non-corrosive barrier between the harsh materials and the frame — completely sealing the building from the inside out, and eliminating the possibility of fertilizer granules or dust settling on the steel. For highly corrosive environments, this method creates the highest layer of protection. Moisture is another common cause of corrosion — particularly in and around ports. Condensation build-up on the building material can cause the chemical reactions necessary for corrosion to start. Keeping fresh air flowing in while exhausting warm, moist air will reduce or eliminate the amount of condensation inside the structure. A passive ventilation system with soffit and ridge ventilation is a cost-effective way to add airflow. One option is to add roof overhangs to the building design, which allows for air intake all along the length of the building. This system is often all that is necessary for a dry environment. Legacy buildings use the same steel frame as pre-engineered metal buildings, and have the same design options — including the ability to add overhangs with vented soffits. They run the length of the facility, eliminating the dead spots common in facilities with endwall ventilation. Overhangs with mesh soffit keep pests out while allowing air to flow in. Combined with peak exhaust vents, overhangs provide cost-effective passive ventilation. Lined fabric buildings use the same ventilation system for the cavity created by between the liner and the outer fabric membrane. This system also can be designed to allows airflow in the storage area of the building and in the frame cavity, preventing moisture build-up throughout the structure. Engineered structures like those by Legacy also use secondary bracing to protect the structural integrity of the building. These secondary members need to be protected from corrosion as well. The bracing cables used in many buildings have multiple grooves that create space for dust to settle, slowly weakening the strength of the bracing cable. An alternative is solid steel rods, which have no hollow areas or indentations. These rods are made of galvanized metal for further protection and are significantly less vulnerable to corrosion than cables. Stopping corrosion is a process that starts before building construction begins. Making a few smart design choices can increase the longevity of any storage facility and provide a safe, cost-effective storage environment for decades.